We’re celebrating #FanFriday with a Drying Lotion beauty giveaway. And this time, there will be two winners instead of one! Please comment on this image on INSTAGRAM to enter to win. Make sure you’re following us! Tell us why you love the Drying Lotion or why you’d like to give it a try! 1. How to get the perfect shave every time. 2. Why are Peptides important for anti-aging? 3. Beauty secrets from the ladies at Mario Badescu Skin Care. 4. How to get better posture and the new way to curl your eyelashes. This beauty giveaway will run from October 4-6, 2013. 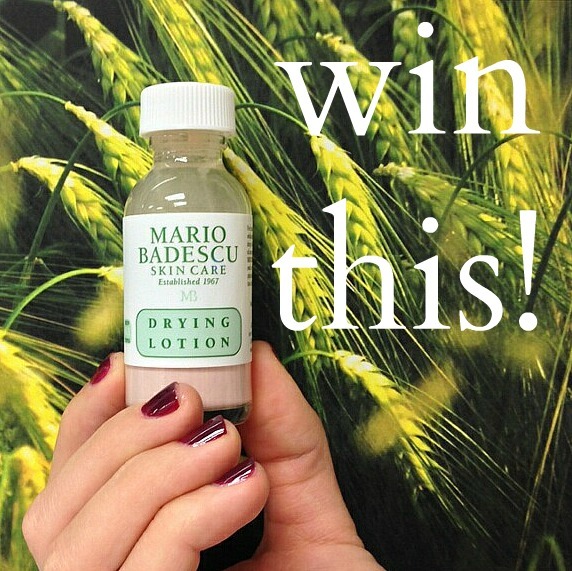 Two winners of the Drying Lotion will be announced on Instagram on the morning of Monday, October 7, 2013. Need a bottle for my tween daughter. Would love to win! Everybody talk about your Drying Lotion like it’s a miracle in a bottle.I want to try it for so long now,it’s my chance to have my own bottle of miracle! I love this stuff so much, it wonderful. I LOVE this product! Def need a new bottle after my husband shook mine! I’m obsessed with this product and haven’t even tried it yet! I have heard so many amazing stories about this product; I would love to have it as a part of my skin care routine! I know it would be as wonderful as I’ve heard over and over again! I have heard so many good things about this product. I would love to try it!! I love MB drying lotion! It works great to dry up acne. I love this product! Works better than I expected! i’d like to give it a try because i’ve heard great things about it! I love the drying lotion! When I have a breakout, I always use the drying lotion to reduce the size and appearance. I need this! Mine leaked out when i drove out to California. I’ve been putting it on without the serum. Doesn’t work the same. And I haven’t had the money to buy another one yet!! Love this product line! Haven’t tried this lotion yet, though. Would really like to try it out. Would love to teach my blemishes a good lesson and try out this popular product! I would love to win this because for years I have spent money trying to find something that will actually get rid of my breakouts with no luck. The breaks have gotten so bad I dont want to go out in public anymore. The only place I go to is school because I have to, and I have neck pain daily from trying to hide my face. I heard good thungs about this product so I will like to give it try with the hope that it work as well for me as it has for others.